Once described as “The Wizard of Oz on acid,” Human Highway was Neil Young’s mind-bending 1982 post-apocalyptic musical comedy film conceived in the cauldron of Cold War America, which the rock legend wrote, directed and starred alongside an eclectic and eccentric cast including Dean Stockwell, Russ Tamblyn, Dennis Hopper and members of the band Devo and may also be the secret origin of The Simpsons. 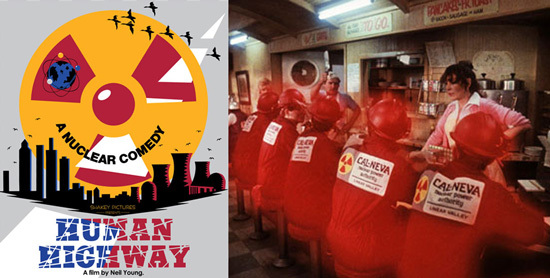 Human Highway was first screened in 1982 at the Mill Valley Film Festival to mixed reviews which caused the producers to and over the intervening 30 years the sections that hit the cutting room floor in that recut have gone astray. So Shakey Pictures decided to see if they could find all those missing bits and rebuild the film as writer, director and star Neil Young originally envisioned it. However restoration very quickly proved to be problematic and was was further compounded by the fact that several of the original masters were missing. 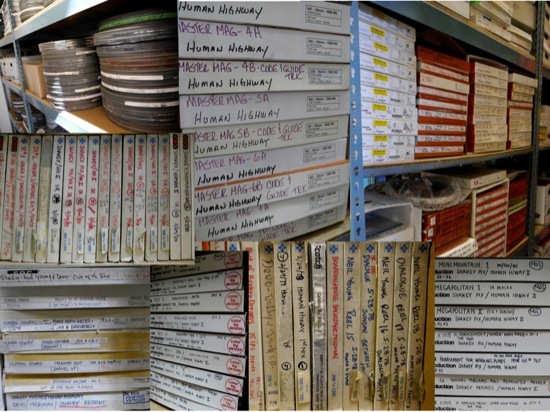 The team had to dig their way through over thirty years of archives, cataloging and viewing every element ever associated with the film in the hopes of finding the masters. They found some 2” 16 track analog masters which were transferred to 24 bit at high resolution but it become clear that music and dialog were not on separate tracks and despite extensive searching they were unable to track down the master dialogue tapes. As I listened through boxes of Nagra reels, I really felt like a fly on the wall of the set” said Will Mitchell of Shakey Pictures “Often tape was rolling wild both before and after takes, so I got to experience the process and understand just where the crew was in capturing the master performances. As with many films, the improvised lines on alternate takes were incredibly creative and fun. It was clear that this was a fun shoot. The actual Nagra IV-SWith all the different parts to the puzzle, some fully mixed, others partly mixed and others using the original source takes it was a challenge to bring them all together to produce a seamless mix and this task fell to Tamara Johnson, Sound Designer & Re-recording Mixer of Post-Apocalyptic Studios. I managed to catch up with Tamara and my first question was to ask here how she handled this enormous needle in a haystack. TJ - When the tapes first arrived it was like walking into a room full of treasure. There was boxes and boxes and it really makes you appreciate that now you can put everything on a thumb drive compared to sometimes needing a fork lift to get everything in. But the real hard work was done by Will at Shakey Pictures and it was monumental what they did. They went to Chace Audio in Burbank and they pulled everything together into a massive Pro Tools session at 96K/24 bit and got everything in sync and presented to me. Then I had to go through and sort it all out, because sometimes dialog was in the clear and sometimes it wasn’t. Sometimes music was in the clear and sometimes it wasn’t. Normally my aim when you are mixing is always too have pristine tracks ready for foreign language versions, but in this case that wasn’t possible because so many of the elements were mixed together. Its a fun experimental movie and the more you work on it, the more you like it, the more you find yourself quoting it. In fact the guys I am working with will often close an email with a line from the movie. The goal was to make the film’s ‘Linear Valley’ setting seem very normal - although it was far from it! So to lull the audience into this normality, the background mix is stereo and dialogue and effects, mono. No panning was used, the sound is pure and comes straight up the middle into the audience. None of it was digital so it had a lot of noise on it and I would need to match the sound very carefully. 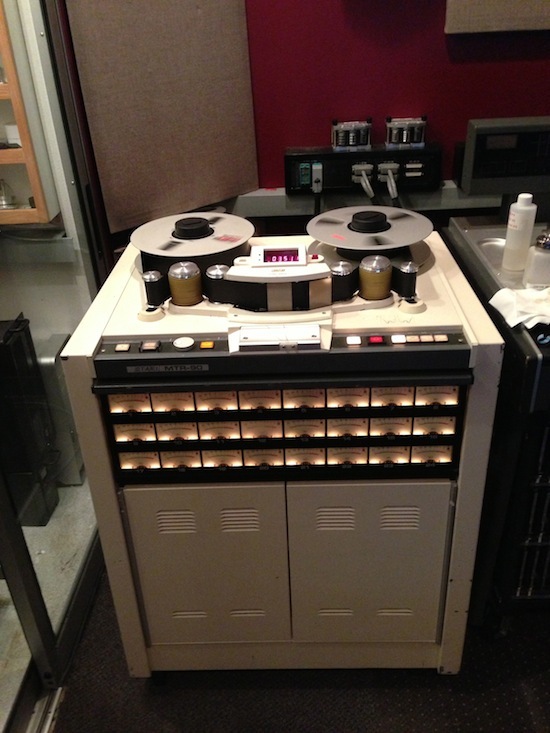 For example I could have a line that would be clean from the Nagra and then it would go right into a full mix. MT - Wow, so a lot of eq matching? TJ - Yes I would use a lot of my favourite plug-ins like the DMG Equality. I also used the Sonnox Restore suite to get rid of the noise, as well as the McDSP Noise Filter. Neil is very fond of a process called Worldising? MT - What exactly is that process? TJ - It’s wonderful, for example if you have something that is playing on a radio then he plays it on a radio and records it. This way he has got the room environment exactly the way he wants it. Since then I have adopted it, I have thought well I could just record this myself, so I will put something on my iPhone, get in my car, play it in my car and record it in my car. MT - And so get the sound through the speakers with the car acoustic all in one hit. TJ - Exactly, it seems old school but it sounds really good. MT - Moving onto the surround element in the film, was the whole film reworked into surround using the Penteo Pro 4 Surround plug-in or was it just for the dream sequence in the film? TJ - It was only the dream sequence. At first I thought great, let’s put the backgrounds in surround and so on but I changed my mind. I wanted to keep the whole movie simple sounding and faithful to the original mix. 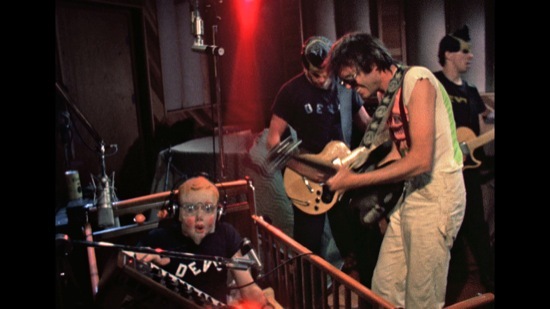 But the film builds up to the climactic scene when Neil Young’s character “Lionel” suffers a bump on the head and drifts into an intense ‘dream sequence’ that sees Lionel become a rock star and performs a ten-minute studio jam scene where Young and Devo play together. I wanted to make Lionel’s dream sequence ‘huge’ using surround elements with wide and isolated channels swirling around the room. We tried to make this scene larger than life and it was vital to have a high quality surround mix with no phasing or delays so I used Penteo to upmix the backgrounds and music into 5.1 Surround for this pivotal dream sequence”. I wanted it to feel like we were inside Neil’s head, effectively placing the viewer in the middle of the scene so that the audience becomes ‘Lionel’ for that intense moment. The film closes when Lionel wakes up and finds himself back in ‘normal’ Linear Valley making the dream is a fantastic contrast to the reality. MT - So did you use different instances of Penteo for the different elements? TJ - Yes, I Penteoised my different sound effects individually, so instead of a 2 track sound effect I had a 5.1 sound effect track and mixed all of those together and it really makes it, so you go wow when the explosion happens and you go into his dream. In fact I think that was the word that Neil used when he first heard it. It was a huge challenge to work and in fact I have described it as an easter egg hunt. It was a wonderful experience and I am very happy with the way it turned out and I am so excited that they are in the Toronto Film Festival. MT - The premiere of Neil Young’s Human Highway (The Director’ Cut) is tonight at The Toronto International Film Festival. Many thanks to Tamara for taking the time to share with us this very interesting and challenging project working for such an iconic artist who always strives for the highest quality.